ALONE (an existential haunting), the infamous Los Angeles ‘October Haunt,” has expanded its showings to include 3 additional separate, but inclusive, experiences in 2015: Diffusion (in June), Refraction (in August), Reflection (in September) and their grand finale Absorption (in October). ALONE was named “Scariest Haunt” – 2013 Golden State Haunts and Events. This year’s theme for ALONE is “Unweave the Rainbow” which is four experiments in human emotion that explore interaction. When light encounters an object, one of four actions occur; diffusion, refraction, reflection and absorption. The experiences will proceed through the Index of Diffusion in June, to the Index of Refraction in August, then to the Index of Reflection in September. After the three Indices constitutive of a rainbow occur, light is finally consumed within the Index of Absorption in October. 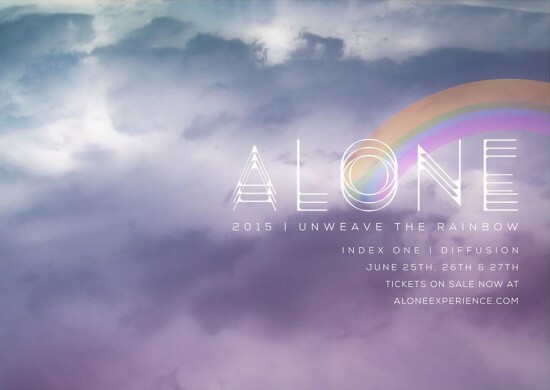 Part one of ALONE: Unweave The Rainbow will be taking place over three nights in June. The Index of Diffusion will unfold in a limited run from June 25th, ,26th and 27th at an undisclosed location in Hollywood, CA. Tickets are currently on sale for Diffusion at: http://aloneexperience.ticketleap.com/alone-diffusion. Tickets for Refraction, Reflection and Absorption will be available in the coming months to the general public and early sales available to subscribers of the ALONE Insider’s List. To sign up for the ALONE Insider’s List, you can enter your email address at www.thealoneexperience.com. By becoming a member of the ALONE Insider’s List you will receive exclusive offers and updates, early/discounted ticket offers and much more. ALONE, now in it’s fourth year is an ongoing, site-specific, fully-immersive and existential experience that explores the range of human emotions. Presenting itself in a variety of configurations, ALONE explores the complex folds of the human psyche, placing you as the participant within dreams and fantasies and nightmares that you may have had and within those that you definitely have not. Your body may be aggressively touched and moved or tenderly embraced or be utterly left displaced and alone.